Major Jack Novak has never failed to meet a challenge--until he meets army nurse Lieutenant Ruth Doherty. When Jack lands in the army hospital after a plane crash, he makes winning Ruth's heart a top priority mission. But he has his work cut out for him. Not only is Ruth focused on her work in order to support her orphaned siblings back home, she carries a shameful secret that keeps her from giving her heart to any man. Can Jack break down her defenses? Or are they destined to go their separate ways? A Memory Between Us is the second book in the WINGS OF GLORY series, which follows the three Novak brothers, B-17 bomber pilots with the US Eighth Air Force stationed in England during World War II. - Publisher Can they overcome the past to find a brighter future together? Major Jack Novak has never failed to meet a challenge--until he meets army nurse Lieutenant Ruth Doherty. When Jack lands in the army hospital after a plane crash, he makes winning Ruth's heart a top-priority mission. But he has his work cut out for him. Not only is Ruth focused on her work in order to support her orphaned siblings back home, she also is determined not to give her heart to any man. As the danger and tension of World War II rise to a fever pitch, Jack and Ruth will need each other more than ever. Can Jack break down her defenses? Or are they destined to go their separate ways? From the English countryside to the perilous skies over France, A Memory Between Us takes you on a journey through love, forgiveness, and sacrifice. "Sundin's excellent grasp of historical context provides vivid details of military life during the war in Europe. This rich tale will delight historical romance fans." 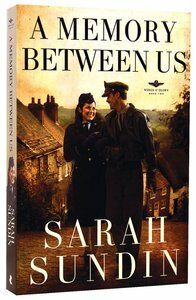 --Suzanne Woods Fisher, bestselling author of The Choice and The Waiting "Sarah Sundin seamlessly weaves World War II aviation history with a deeply emotional romance to continue her fabulous Wings of Glory series. She displays a talent that destines her for stardom in the genre." --Cheryl Bolen, winner of the Holt Medallion, Best Historical Romance "Fans of historical romance will be captivated by this exciting story. From the first page, Sarah Sundin planted me in the midst of World War II and into the lives of her characters. This captivating romantic ride through the fascinating and horrifying days of World War II is a must-read." --Bonnie Leon, author, the Sydney Cove series and Alaskan Skies series Sarah Sundin is the author of A Distant Melody. Her great-uncle flew with the US Eighth Air Force in England during WWII. Sarah lives in California with her husband and three children. Can they overcome the past to find a brighter future together? Major Jack Novak has never failed to meet a challenge--until he meets army nurse Lieutenant Ruth Doherty. When Jack lands in the army hospital after a plane crash, he makes winning Ruth's heart a top-priority mission. But he has his work cut out for him. Not only is Ruth focused on her work in order to support her orphaned siblings back home, she also is determined not to give her heart to any man. As the danger and tension of World War II rise to a fever pitch, Jack and Ruth will need each other more than ever. Can Jack break down her defenses? Or are they destined to go their separate ways? From the English countryside to the perilous skies over France, A Memory Between Us takes you on a journey through love, forgiveness, and sacrifice. "Sundin's excellent grasp of historical context provides vivid details of military life during the war in Europe. This rich tale will delight historical romance fans." --Suzanne Woods Fisher, bestselling author of The Choice and The Waiting "Sarah Sundin seamlessly weaves World War II aviation history with a deeply emotional romance to continue her fabulous Wings of Glory series. She displays a talent that destines her for stardom in the genre." --Cheryl Bolen, winner of the Holt Medallion, Best Historical Romance "Fans of historical romance will be captivated by this exciting story. From the first page, Sarah Sundin planted me in the midst of World War II and into the lives of her characters. This captivating romantic ride through the fascinating and horrifying days of World War II is a must-read." --Bonnie Leon, author, the Sydney Cove series and Alaskan Skies series Sarah Sundin is the author of A Distant Melody. Her great-uncle flew with the US Eighth Air Force in England during WWII. Sarah lives in California with her husband and three children.